Opened in 1944, Lymington was a prototype for the type of temporary Advanced Landing Ground type airfield which would be built in France after D-Day, when the need for advanced landing fields would become urgent as the Allied forces moved east across France and Germany. It was used by the Royal Air Force, Canadian and the United States Army Air Forces. It was closed in 1946 after two years of being utilized as a storage area for the Royal Navy. Today the airfield is a mixture of agricultural fields with a private grass airfield using the North/South runway. 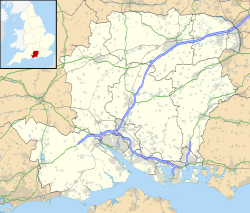 Lymington was known as USAAF Station AAF-551 for security reasons by the USAAF during the war, and by which it was referred to instead of location. It's USAAF Station Code was "LY". With the facility released from military control in 1946, almost all traces of the former airfield were removed. One of the original blister hangars remains on the standing today adjacent to a private grass airstrip (Pylewell House) overlaid on the site of the former N/S military airfield runway, (31/13). The airfield appears to be closed, with white "X"s shown on the runway ends. Wikimedia Commons has media related to RAF Lymington.